Last week I got a text asking me to sum up my cooking style in one sentence. I never really thought about my cooking style, I just like to cook. Tell me what you want to eat, and I can make it. Just don’t request Indian food, because I have yet to see eye to eye with that cuisine. I don’t know what it is, but I think there’s something about the spice combinations that don’t agree with me. And if I can’t eat it, I don’t cook it. Other than that, I’m your girl if you want something magical to eat. Do I think I’m the greatest cook that ever lived? Of course not. All I know is that when people eat my food, they get happy and invite me to move into to their homes. I’ve been proposed to by many men who have been inspired to profess their love to me after they’ve eaten something I’ve prepared. Since none of them were Idris Elba, I had to explain that I was happily married and declined each offer. One man even ask if I would be willing to adopt him instead. He said, “I’d live in a shed out back just as long as I had access to whatever you’re rustling up in the kitchen.” I had no interest in adopting a grown man, but it was nice to be appreciated for what I do. The dishes I make usually inspire happiness and joy. Based on my experience, the only food style I could think of that provoked these feelings was good old-fashioned comfort food. A comfort food point of view sounded pretty good to me. All I had to do was convey it in one sentence. 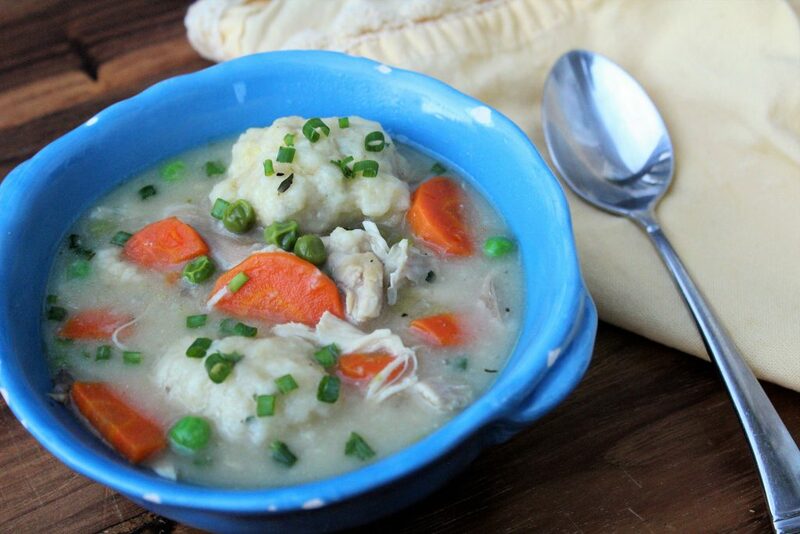 When I think about comfort food, my grandmother always pops into my head. My Nana was an amazing cook, and she could make anything taste good just by touching it. The woman was anointed! She made heavenly meals simply by throwing scraps together. When you ate Nana’s cooking, you just knew she loved you. That’s how good it was. And whenever I ate her chicken and dumplings, all I wanted to do was sit on her lap, lay my head on her shoulder and take a nap. Nana was the original queen of comfort food, and I am happy and honored to follow in her foot steps. I am the Queen of Comfort Food, and I make food that comforts the heart and satisfies the soul. Let me know when you make this recipe. 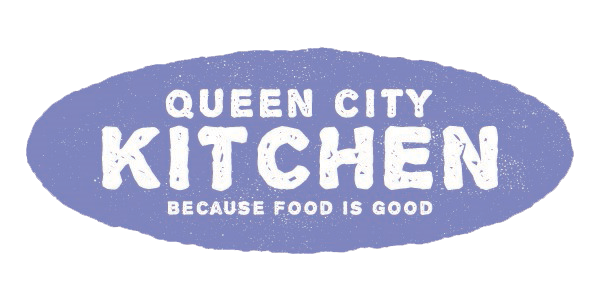 Take a picture and hashtag it #QUEENCITYKITCHEN on Instagram. I can’t wait to see what you post! Rinse the chicken inside and out, and pat the outside dry with paper towels. Generously season the inside of the chicken with salt and pepper. Rub oil on the chicken and sprinkle salt and pepper over the surface of the skin. Roast the chicken until golden brown and the juices run clear, about 1½ hours, rotating the pan halfway through the roasting time. Remove the chicken from the oven and drain off the chicken fat into a measuring cup. You should have at least ¼ cup. Cover the chicken with aluminum foil and allow to cool for 20 minutes. When the chicken is cool enough to handle, remove the skin and bones from the meat. Shred the chicken and set aside. Discard the skin and bones. Heat the chicken broth and bouillon cubes in a medium saucepan over medium heat, stirring occasionally to dissolve the bouillon cubes. Reduce the heat to low to keep warm. Heat ¼ of the reserve chicken fat in a Dutch oven over medium heat. Add the onions, celery, carrot, mushrooms, and thyme. Season with salt and pepper. Cook until the vegetables are tender, about 4 minutes, stirring occasionally. Sprinkle in ⅓ cup flour, stirring constantly for 1 minute. Slowly whisk in the warm chicken stock until no lumps remain. Add the chicken and peas and bring the broth to a boil. Reduce the heat to medium-low and simmer gently. Stir in the heavy cream. Season with salt and pepper to taste. Scoop heaping tablespoons of the dumpling mixture onto the stew, leaving a little space between the dumplings. Cover the pot and reduce the heat to low. Cook until the dumplings are puffed and cooked through, about 18 mins. Remove lid and ladle the stew into bowls. Garnish with parsley and chives. 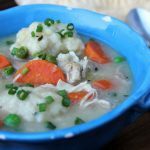 This entry was posted in Chicken, Recipes, Southern, Stew and tagged chicken, comfort food, dumplings, southern cooking, stew on March 27, 2018 by Andria Gaskins.